This completely revised and updated edition of Irwin Stambler and Grelun Landon's landmark encyclopedia of country music isn't limited to pure country anymore; in fact, its broad range covers country, country rock, bluegrass, rockabilly, country gospel, honky-tonk, western swing, cowboy (and cowgirl!) singers, and more! And unlike other encyclopedias, Country Music: The Encyclopedia is more than just a list of names and dates. It's the most personal country music reference book there is, filled with original, first-person interviews with stars young and old, from Garth Brooks to Patsy Cline. 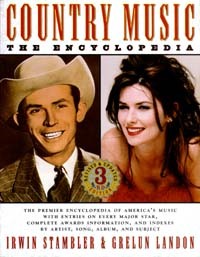 And in addition to the entries, 75 perscent of which are new or substantially revised, there is a series of indexes that allows you to reference song titles, album titles, performers, and types of musicas well as anything else that interests you in a general subject indexthat makes Country Music: The Encyclopedia the greatest book of its kind. Irwin Stambler and Grelun Landon's previous editions of this book were entitled The Encyclopedia of Folk, Country and Western Music (SMP, 1969, 1982, hardcover; 1984, trade paperback). Both Stambler and Landon live and work in Los Angeles.